Jim Hanchett has covered major news stories as a journalist for various media outlets, including NBC. These stories included the Bush – Gore 2000 election, the Pope’s visit to Cuba and Bill Clinton’s impeachment trial for several media outlets. In 2012, Jim turned in his media accreditation card and now is telling the story of the Indiana University School of Public and Environmental Affairs (SPEA), where he is the director of marketing and communications. Jim shared some of the different challenges and tactics to communicating the value of a public affairs degree by video, as well as his approach to media training his faculty colleagues. In addition, Jim and host Kevin Anselmo discussed Experiential Communications’ inaugural public relations and communications survey of schools focused on public policy and public affairs. The 10-question survey was conducted in May and June 2015 with the goal of providing schools’ leadership with a benchmark to gauge their communications activities. A total of 15 of the top 30 schools ranked by US News and World Report took part in the survey. Respondents consisted of communications directors, PR directors, deans and program directors. Seven schools (46.47%) responded that they were on the right track in linking their PR activities to their school’s overall strategy, while the remaining schools felt that more work needed to be done in this area. In addition, schools that have invested in content initiatives are in the minority. However, schools that have invested in content note that these initiatives are working well and accomplishing the set forth goals. Jim shared some perspectives as to how he approaches these areas at SPEA and provided some best practice that any university communicator can apply. 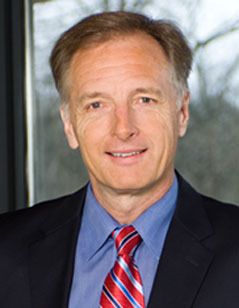 Jim Hanchett has been the director of marketing and communications at the Indiana University School of Public and Environmental Affairs since 2012. Previously, Hanchett worked as a professional journalist with more than 30 years of newspaper, online, radio, and local and network television experience. Hanchett served as senior political correspondent for NBC stations in the disputed 2000 Bush-Gore presidential election. Other major news assignments Hanchett has covered include the O.J. Simpson murder trial, the Oklahoma City bombing, Pope John Paul’s visits to Cuba and Colorado, the impeachment trial of President Bill Clinton, and the Yellowstone National Park wildfires. He has earned numerous awards for his work, including an Emmy for broadcast newswriting. Hanchett has worked as the news director and anchor for the Charlottesville Newsplex (2010-12); managing editor and anchor for WECT-TV in Wilmington, North Carolina (2001-10); correspondent, NBC News Channel, in Denver, Los Angeles, and Washington, D.C. (1990-2000); reporter, KCNC-TV (1992-2000) and Rocky Mountain News (1991-92), both in Denver; and for the Eagle-Tribune in Lawrence, Massachusetts (1990-92). Hanchett has given presentations at the University of Virginia, Colorado State University, University of Wyoming, University of Colorado, University of Northern Colorado, University of North Carolina Wilmington, and several community colleges as a guest lecturer. He believes strongly in the use of humor in written communications and thinks he’s funny. On rare occasions, that assessment is accurate.